Finally, rest assured and enjoy your trip, whether you’re traveling for business or pleasure. 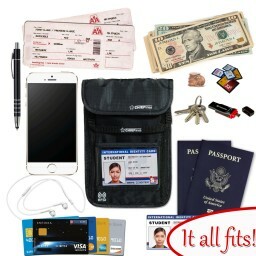 • ANTI-THEFT MATERIALS: If you knew that someone out there could actually read your credit and ID card details without even having to go anywhere near your wallet, wouldn’t you want to be prepared? I am sure you will love the idea of having peace of mind with this SPECIAL ANTI-THEFT RFID BLOCKING wallet that can guard your belongings against thieves and intruders. Finally, rest assured and enjoy your trip, whether you’re traveling for business or pleasure. • STYLISH & UTILITARIAN: When it comes to utilitarian design I don’t think you’ll find a wallet that can satisfy you more than this SMALL, yet EXTRA SPACIOUS travel neck wallet. 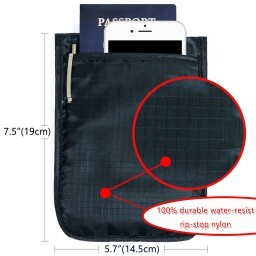 This pouch has enough room to keep all your TRAVEL DOCUMENTS, including ID, Passport, Driver’s License; It has 5 SEPARATE Credit Card POCKETS, a handy BACK POCKET for QUICK ACCESS where you can keep your phone or boarding pass, a KEY HOOK and of course, safe ZIPPERED POCKETS WITH ROPE for money. • COMPACT & LIGHTWEIGHT: This BLACK, STYLISH, yet DISCREET travel neck pouch is the perfect accessory for your travel gear. Compact and slim, it can take so much without looking too bulky. If you are looking for a classic, reliable neck wallet that is also extremely LIGHTWEIGHT and easy to carry with you, then you need look no further. 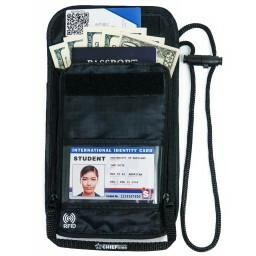 This superior travel neck wallet will satisfy even the most demanding travelers. • COMFORTABLE UNDER CLOTHING STORAGE: Keep your belongings and documents safe and hidden from undesirable eyes. Prevent pickpocketing by wearing this absolutely COMFY, HANDY, undercover neck wallet just underneath your clothes. This amazing wallet feels soft to the skin and is small and light enough to carry with you all day long. • UNISEX DESIGN: Suitable for both men and women, this unisex neck wallet is the best travel gift for your friends and family.